In worksheet on fractions, the questions are based on comparing the fractions; arranging the fractions in ascending and descending order; find the sum and the difference of the fractions; equivalent fractions; simplifying fractions and also word problems on adding and subtracting fractions. This exercise sheet on fractions has different types of questions that can be practiced by the students to get more ideas to solve all types of questions in fractions for seventh grade math students. 4. Write five equivalent fractions of 3/5. 9. What should be added to 5³/₇ to get 12? 10. What should be added to 5⁴/₁₅ to get 12³/₅? 11. Patty studies for 5²/₃ hours daily. She devotes 2⁴/₅ hours of her time for Science and Mathematics. How much time does she devote for other subjects? 12. A piece of wire is of length 12³/₄ m. If it is cut into two pieces in such a way that the length of one piece is 5¹/₄ m. What is the length of the other piece? 13. A rectangular sheet of paper is 12¹/₂ cm long and 10²/₃ cm wide. Find the perimeter. 14. 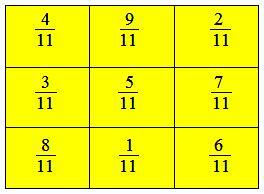 In a “magic square”, the sum of the numbers in each row, in each column and along the diagonal is the same. Is this a magic square? 15. The cost of Mathematics book is $25³/₄ and that of Science book is $20¹/₂. Which costs more and by how much? Students can check the answers of the worksheet on fractions given below to make sure that the answers are correct. If students have any queries regarding the questions given in the worksheet on fractions, please fill-up the comment box so that we can help you.